Wh at's going to be happening at our reunion? Here's a partial list of events, still subject to change. This is the April 12 revision. If you'd like to download a .pdf copy that you can print out, click the symbol at the right. Often you'll have a choice of events taking place at the same time. The icon below links to additional details about a particular event. A green dollar sign $ denotes an event with an extra charge. A red asterisk * denotes an event specifically for the Class of 1969 50th Reunion group. In May, the college will print the complete schedule in a handy "Red Book" and make it available as an app. Note: These events are not scheduled or managed by Oberlin College. Classmate volunteers have organized them for us all to begin celebrating a few days earlier! All are optional, and details are on this page. 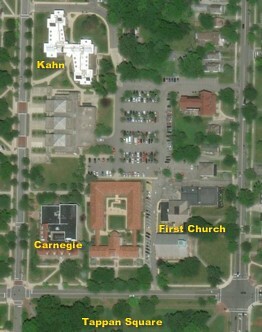 Reunion headquarters for the Class of 1969 is Kahn Hall, 169 North Professor Street. The Kahn Hall lounge is available for informal visiting throughout the weekend. Several events will be held at First Church, 106 North Main Street. Rehearsal for the All-Class Reunion Choral Sing (performance on Saturday). The Brahms German Requiem will be sung in memory of Robert Fountain and the losses to our Obie class families. All reunion attendees, parents, and friends are invited to attend or join in singing. Enjoy plenty of food under the Big Top in an interactive and intergenerational setting, toast the Class of 2019 as you welcome them into the Alumni Association, celebrate the alumni community, and join the fun by playing Oberlin Bingo for your chance to win a prize. Sign language interpretation will be included. Reserved seating has been arranged for members of the Class of 1969 in the Big Top tent. In addition to the coffee, tea, and light refreshments in Kahn Hall, First Floor Lounge, alumni and their guests with official nametags are invited to enjoy a continental breakfast in the Carnegie Building, Root Room (the former library reading room). The format will be a Samoan Circle. One topic is titled "Progressive Activism: What Can We Do Now?" You can move from table to table, each with a topic being discussed. Issues include caring for family members, climate change, and racism. A celebratory reception congratulating the Class of 2019 and recognizing families and alumni of the Conservatory and College music degree programs. Hosted by the Dean of the Conservatory and conservatory faculty. Outstanding conservatory seniors will perform. Free admission. Classmates present an Entertainment Extravaganza. Come One, Come All! In addition to the coffee, tea, and light refreshments in Kahn Hall, First Floor Lounge, alumni and their guests with official nametags are invited to enjoy a continental breakfast in the Carnegie Building, Root Room. A special Commencement/Reunion Weekend convocation featuring President Carmen Twillie Ambar's state-of-the-college address, the announcment of reunion class gift totals, the presentation of three Alumni Association awards, a celebration of the Class of 2019, and an organ recital. The ice cream social will feature novelties from Cowhaus Creamery, owned and operated by Josef Bomback '76. A multifaith celebration with blessings and reflections in honor of the Class of 2019, alumni, families, and friends, including musical tributes by Conservatory musicians. Spnsored by the Office of Religious and Spiritual Life and the Office of the President. Come hear stories from your classmates --- of all different types, from all kinds of sources, about all kinds of subjects. Although the allotted time has essentially been filled with classmates' stories, you are most welcome to join in as a listener. Sharing is a conversation. Both ends are important! Private tour for the Class of 1969. Guest speakers for our Class Dinner will be Brian Alegant, professor of music theory, and Cynthia Frantz, professor of psychology and environmental studies. This old-fashioned ice cream social has become a mainstay of Illumination night. Tappan Square at its most beautiful, with hundreds of colored Japanese lanterns strung across the green. An Oberlin jazz ensemble will begin performing at 9:30 PM. Immediately following the jazz performance, Oberlin Steel will perform on the steps of Finney Chapel in the tradition of great steel bands of Trinidad with arrangments of salsa, calypso, and jazz tunes, as well as original compositions and arrangements by band members. A live audio/visual feed of the commencement ceremony will take place in Warner Concert Hall beginning at 9:15 AM. Doors open at 8:15 AM. Transportation to Kendall will be available starting at 11:30 AM in front of Kahn Hall. (If you've been staying at Kahn, check out of your room before you board the shuttle, because checkout time is 1:00 PM.) A return shuttle will be available at 2:00 PM. Please note that the shuttle will make multiple trips to accommodate everyone.